So many superhero roles, so many actors, how do you keep track of it all? 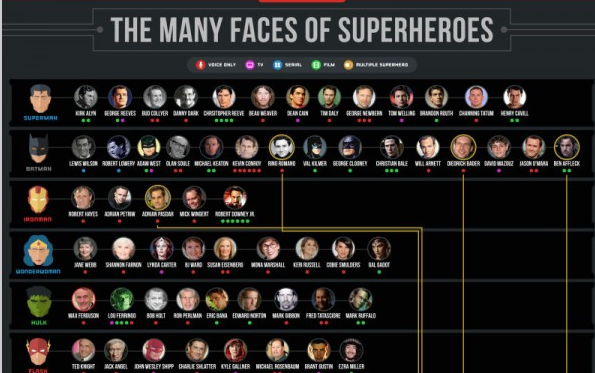 Well, the nice folks at Sploid were kind enough to put up a chart, "The Many Faces of Superheroes," to try and make it easy. 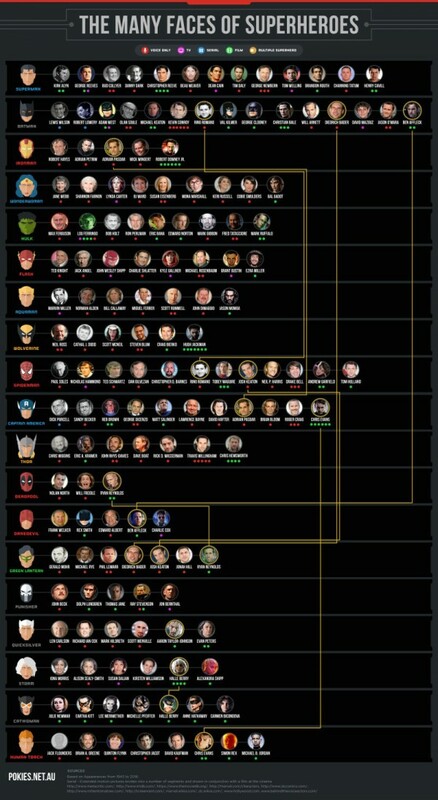 The infographic charts the hero with the many actors in different mediums that appeared or voiced them. No surprise that Batman, Spider-Man and Superman had the most actors portray them but surprisingly Captain America wasn't too far behind. While the chart seems pretty thorough I noticed some voice actors were missing, like Rosario Dawson as Wonder Woman in 'Justice League: Throne of Atlantis' animated DVD. Still, not a bad reference guide. Check it out. I've noticed that you've credited Sploid for the creation of this chart, however the actual creators were http://pokies.net.au/. I'll have to reword it as Sploid didn't credit Pokies. Sploid is where it was found though.